Similarly, a few years later when I was a Bible teacher at a private Christian school and teaching high school seniors in an “Apologetics” class, I shared with them that our trends seem to be following that of Europe and Canada, where the United States will soon be recognized as a fully secular society, with self-identified and active Christians making up low double digit percentages of our society. My goal was to engage students in conversation about evangelism and, though I did not have the answers, point out that based upon the data there seemed to be a great need for more effective methods of evangelism. In this case, I was also asked by my supervisors why I would be sharing this “negative” information with students and was told to cease doing so. Now, almost two decades after being on that mega-church staff and with the data showing the predictable increases among the “Nones”, I still have these types of conversations and find similar responses within local and institutional church systems. One of the responses has been, “Well, this is mostly about young people, a group that has always bailed on the Church. They’ll come back, especially once they have kids.” But the studies simply do not bear this out. What the research shows is that 1) they do not “always come back” if they were affiliated and 2) a growing segment will not “come back” because they were never affiliated in the first place. However, what is key to recognize that the data also reveals that these positive religious/church experiences are doing very little to keep people. As the advocates of the Missional Church movement have been saying for a while, the Attractional Church Models, which place worship service and programs at the center of congregational strategies and resources, are not impacting our larger society in terms of new adherents or even retaining many of those already in the religious group. The approach to church or religious involvement must be about more than good, entertaining, or quality experiences. 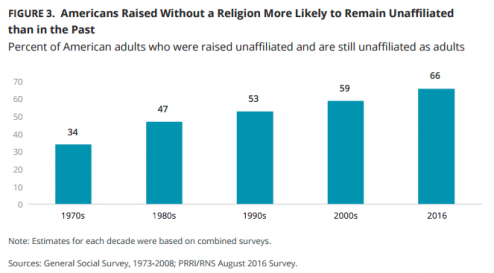 The reasons Americans leave their childhood religion are varied, but a lack of belief in teaching of religion was the most commonly cited reason for disaffiliation. Among the reasons Americans identified as important motivations in leaving their childhood religion are: they stopped believing in the religion’s teachings (60%), their family was never that religious when they were growing up (32%), and their experience of negative religious teachings about or treatment of gay and lesbian people (29%). Among those who left their childhood religion, women are twice as likely as men to say negative religious teachings about or treatment of gay and lesbian individuals was a major reason they chose to leave their religion (40% vs. 20%, respectively). Women are also about twice as likely as men to cite the clergy sexual-abuse scandal as an important reason they left their childhood faith (26% vs. 13%, respectively). Young adults (age 18 to 29) who left their childhood religion are about three times more likely than seniors (age 65 and older) to say negative religious teachings about and treatment of the gay and lesbian community was a primary reason for leaving their childhood faith (39% vs 12%, respectively). Young adults are also more likely than seniors to say being raised in a family that was not that religious was a major reason they no longer affiliate with a religion (36% vs. 23%, respectively). It is my opinion that some of this is related more to how these issues are approached and addressed than the conclusions and views that religious groups represent on these topics. The study also quickly addresses other issues, including the impact of family dynamics and organized religion in general, as well political views of various groups designated in the study. 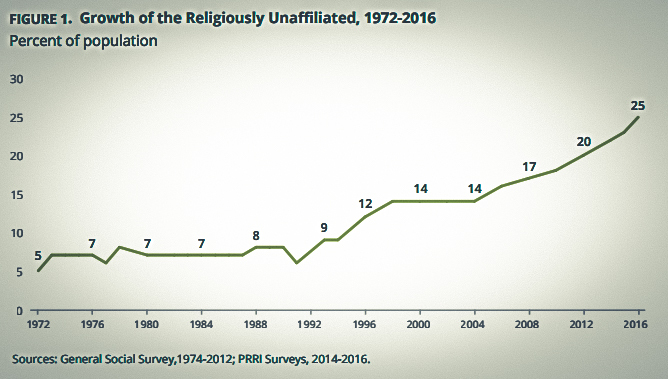 I highly encourage anyone interested the current or future state of religion and religious affiliation in the U.S. to read the report. 1. [back to text] When I say this is “fascinating,” it is because according to the Pew data (visible “Figure 1” at the top of this article), the substantial increase in the “Nones” almost exactly corresponds to the Church Growth phenomenon beginning around 1992. For timeline perspective on this, the Willow Creek Association began in 1992. Saddleback Community Church’s models began being widely used, based on that church’s success, in the early 1990’s. Saddeback’s pastor, Rick Warren, published Purpose Driven Church in 1995. It is in Warren’s book that the term “Attractional Church Model” is used, and Willow Creek made popular the term “seeker sensitive.” Willow Creek, due to research on their own congregation in the early 2000’s, has since significantly rethought their approach and strategy, noting that the model did increase attendance, but did not necessarily and effectively result in committed followers of Jesus.